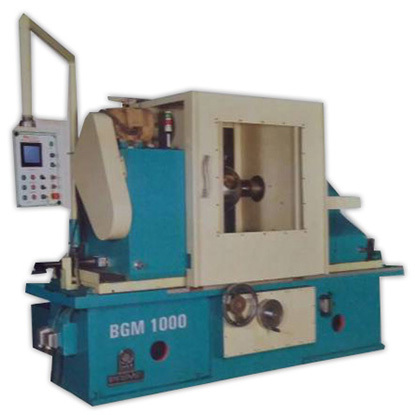 Prime Machine tools is Manufacturer of Ball grinding And generating Machine With Prime's Spirit of Precision, Perfection and Supeiorily, Prime Ball Grinding And Generating Machine Generally Meant for Metalic & non Metalics Balls of Ball Valve, Ball mills, Crasser Ball, Like - Material -S.S 304, S.S 316, S.S 410, M.S,& Alloy Steel cast for Microns Accuracy. The Machine Table is Special Designed And Close Grained Cast - Iron. A.C. Drive Provided to get Variable Speed of Grinding And Generating tool Cutter Holder For Achieving high Production Good Accuracies & Optimum R.P.M of tool Cutter Holder. Special heat trated, Ground & Lapped Spindle Runs on Antibriction Bearing. Give High Accurancy & True Running To Spindle. A.C. Drive Provided to get Variable Speed of Work- Head Spindle / Work -Piece For Achieving.high Production Good Accuracies & Optimum R.P.M of Work - Piece Can be Set. Special Heat Treated Ground, Lapped & Heavy dutty Ram For Achieving high Accuracies. ELECTRONICMOTOR Wheel Head Motor 15 H.P 20 H.P. Coolant Pump 0.25 H.P 0.25 H.P.